Before it was an Oscar-winning film, this simple story of a fading Southern matron and her ageing black chauffeur was a play. 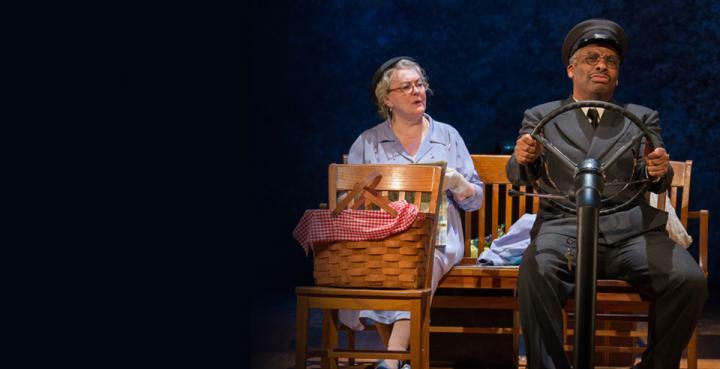 This touring revival is a straightforward but stylishly presented production of Alfred Uhry’s script, containing two magnetic performances by Gwen Taylor as Miss Daisy and Don Warrington as Hoke. The third member of the cast is Ian Porter as Daisy’s son ‘Boolie’ – it is he who sets the plot in motion by recruiting Hoke when his mother proves she is no longer able to drive herself around. At first, Hoke meets with resistance from the proud old woman – it is a week before she relents and allows him to take her to the Piggly Wiggly supermarket. After that initial outing, a slow thawing begins and in a series of scenes that dip into their lives over a period of twenty-odd years, we see the bond that has formed between the pair in their declining years. “I was never prejudiced” is Miss Daisy’s constant refrain, usually as a preface to some declaration about “They All” doing this or that. She learns the error of her ways but it’s not a complete conversion – Uhry’s script keeps away from the saccharine and the mawkish, deftly depicting the war of wills between the characters with gentle humour and the occasionally touching moment. The play is set against the (projected) backdrop of the Civil Rights Movement – Miss Daisy and Hoke are kind of a microcosmic representation of this. The personal is political, after all. Gwen Taylor plays Miss Daisy as strong but with increasing fragility. Don Warrington’s Hoke is sardonic, patient and as proud as his elderly employer. Ian Porter matches them for authenticity and characterisation. Director David Esdbjornson keeps transitions slick – the staging is simplistic with Wendall K Harrington’s projections clarifying locations and illustrating the wider context of the action. It’s a charming and funny 90 minutes that touches your heartstrings rather than punching you in the guts. The world has come a long way since Martin Luther King told us about his dream, and still has a way to go yet, but for me the starkest aspect of the play is the physical and/or mental decline that awaits us (if we’re lucky!) and the importance of companionship along life’s road. This may sound depressing but like Hoke the chauffeur, this show will give you a lift.